On the first day of school I made the kids pancakes using a boxed mix from our favorite pancake place, Kerby Lane. If you have ever stepped foot in Austin and not had their pancakes that is a mistake you will regret for the rest of your life, but that is another story. They actually recommend that you cook them on cast iron. I don't have a cast iron griddle and was thinking I really needed to remedy that situation. 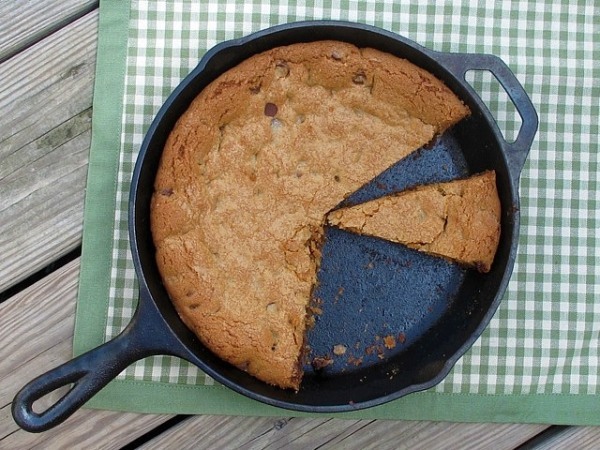 Then I saw these yummy skillet cookies from One Ordinary Day and now I need a cast iron skillet too. Is anything low calorie ever cooked in cast iron? It almost seems like a contradiction. If you have a cast iron skillet, you can get the recipe for these yummy cookies HERE. Serve ice cream and chocolate syrup over them while they are still warm. If you don't have a cast iron skillet, now you have a good reason to buy one! You DO need a cast iron skillet! This recipe is definitely worth the trip to the store for one. You'll love cast iron. I have two and use them all the time. It's been 7 years since we lived in Austin, but I crave gingerbread pancakes from Kerby Lane at least once a month! Yum.